If you have ever found old documents related to your family, you've probably struggled to read the writing on them. I've puzzled over the interpretation of an old blessing document for several years with little progress. After spending an hour studying the document, I'll lay it down for a week or month and then try to add additional words to my transcription. Often the rest period frees my mind from the interpretation that I've 'locked' in my brain and previously undecipherable words become readable. Several methods to help us read old documents are available to all of us. 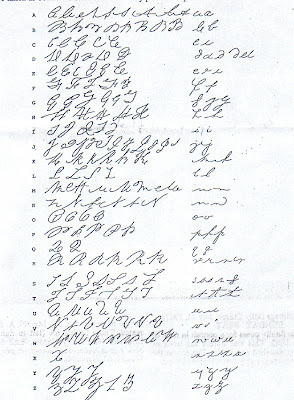 Study the way the vowels are shaped throughout the document. Trace them and write them down with a alphabetic key by their side. Next, explore the document for other letters that are recognizable and add them to your list. Soon, you'll have enough characters defined that you can interpolate the words in the document even if you can't read some or even many of the letters. Search the web and local family history supply stores for example lists of old writing with the alphabet listed down the side. Add these tools to your research quiver. Below is an example of 1800 English writing with the associated alphabetic letters listed in rows. Yes, it sometimes takes a lot of time to transcribe old documents, but they often provide the key items that lead us to knocking down 'brick walls' in our ancestral quest.